They ignore decades of educational research showing that family income and other outside-of-school factors impact student achievement more than anything else. If the Milwaukee Brewers happened to face the New York Yankees in the World Series this year, the print reporters and the sports talkers on TV and radio would have a field day with the difference in payrolls. The Evil Empire’s 2017 salaries exceed $200 million, while the Brewers’ top out at $63 million. Having over three times the resources of your opponent is a clear advantage that will result in better outcomes. It’s unfair and it’s not impossible to overcome, but it is reality and an obvious factor to acknowledge. It would be shockingly poor journalism to neglect this disparity. 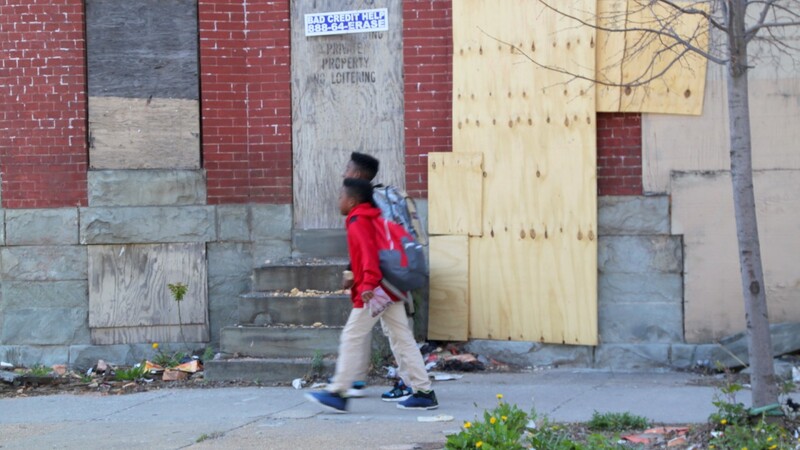 When the results come back after students take their annual state-mandated Partnership for Assessments of Career and College Readiness (PARCC) tests, the Baltimore Sun and other outlets regularly commit this journalistic neglect. Reading their coverage of the latest results last month, one would think that curricular choices, administrative decisions and teacher performance were the causal factors. Regression analysis has shown that family income and non-school factors account for 60% of the variance in student test scores (Haertel, 2013; Borman and Dowling, 2012; Coleman et. al., 1966). Only 20% of the variance is attributed to work inside of the school building – and only half of that falls within teachers’ control (American Statistical Association, 2014). Put another way, out-of-school factors are six times as powerful an effect on test score results as classroom teaching. It makes sense when you think about it. A child fully nourished with healthy foods, well rested from a comfortable bed, with high quality health care, their own computer at home and in school, a safe and quiet place to work and read, and a history of investment in their needs will outscore a student lacking all of these necessities. Sure enough, the 2017 PARCC data fits the pattern of test scores correlating most heavily with income. 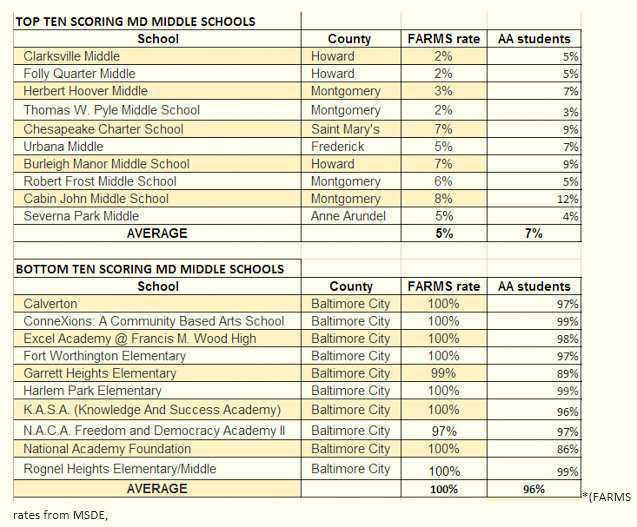 Take, for example, the poverty rate for the top 10 scoring middle schools in the state compared to the bottom 10 (as measured by eligibility for FARMs, Free And Reduced-price Meals). The average student poverty rate for the top 10 scoring schools is 4.7%, or about one in every 20 students. The bottom 10 scoring schools on the PARCC test have an average of 99.6% of their students living in poverty, basically 20 out of 20 students. This phenomenon is larger than the usual rich Howard County vs. poor Baltimore City narrative. When narrowing our focus to just Howard County middle schools we see that the richest, Clarksville, tops the charts with an 81% passing rate. The poorest middle school, Lake Elkhorn, has the lowest passing rate at 27%. When adding in the racial compositions of these schools (average of 7% African American in the top 10) and 97% African American in the bottom 10), the stark nature of Maryland’s segregation reveals itself. Antero Pietila’s “Not in my Neighborhood” details centuries of racist laws and policies (at the federal, state and local levels) in housing, employment and incarceration that created Maryland’s geography of rich white enclaves and pockets of concentrated poverty filled disproportionately with people of color. Because school funding is tied to property values that were actively engineered to ensure that some folks got and others didn’t, the schools in greatest need are the most under-resourced. When we deny such history, we end up wrongly attributing the differential in outside-of-school factors to individual flaws rather than to racism and government policy. The media’s ahistorical reporting and complete omission of the primary factor impacting PARCC scores leaves a dangerous space for the public to misdiagnose the problem and potential solutions. A throwaway line about inequities in school funding (though they are severe and clearly a factor) isn’t enough. Out-of-school influences are larger than school funding. They are about family income, the neighborhood, air quality, access to jobs, healthy foods, health care and much more. When news coverage ignores that, it leads politicians to blame students, teachers and administrators working in our toughest schools. It prevents people from seeing the data for what it is, a vicious critique of our unjust and inequitable society and the policies that have helped to create it. As school begins, let’s remember that classic bit of test-taking advice: make sure you understand the problem before you start trying to solve it. Corey Gaber is a 6th grade literacy teacher and lacrosse coach at Southwest Baltimore Charter School. He’s a founding member of BMORE (Baltimore Movement Of Rank and file Educators), a caucus of the Baltimore Teachers Union.